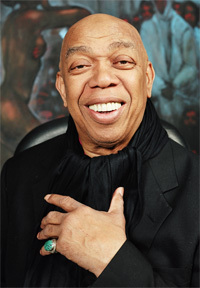 With an award-winning career spanning six decades, Geoffrey Holder has done it all. His inherent creativity thrives through dance, painting, choreography, costume design, acting, photography, and writing. Holder was born on August 1, 1930 in Port-of-Spain, Trinidad. Inspired by his artistic family, particularly his older brother Boscoe who taught him painting and dancing, Holder joined his brother’s dance troupe, the Holder Dance Company, when he was seven. He took over as director of the ensemble a decade later when Boscoe moved to London. As a young dancer, Holder toured the West Indies and Puerto Rico before making his New York stage debut in 1954, a pivotal point both personally and professionally because the towering (6’6”), breathtakingly limber interpretive dancer was chosen to perform in Harold Arlen’s Broadway musical House of Flowers. 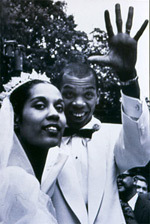 It was there that he met the beautiful young dancer Carmen de Lavallade, who became his wife in 1955. He was a principal dancer with the Metropolitan Opera Ballet, and in 1956, he formed his own troupe, Geoffrey Holder and Company. His talents as a performer were increasingly in demand and would eventually lead to his creation of classic works for both the Alvin Ailey American Dance Theater and the Dance Theatre of Harlem. Holder made his dramatic theatrical debut in 1957 in the near-mime role of Lucky in the all-black production of Waiting for Godot. His subsequent stage work has earned him numerous awards, including two Tony Awards for his groundbreaking work as a director and costume designer for the hit Broadway musical, The Wiz, in 1974. He followed in 1978 with another Broadway smash, directing and choreographing the lavish production Timbuktu! Holder’s talent as a visual artist was initially noticed at the age of 15 with the sale of two paintings. In 1957, the accomplished artist won a prestigious Guggenheim Fellowship in painting. His success in other endeavors notwithstanding, Holder has never stopped painting; his works continue to be showcased in major museums and galleries around the globe. Holder is also the author and illustrator of many books. He co-wrote with Tom Harshman and illustrated Black Gods, Green Islands, a collection of Caribbean folklore, as well as Geoffrey Holder’s Caribbean Cookbook. His latest book is the massive achievement Geoffrey Holder: A Life in Theater, Dance and Art. Holder resides in New York, where he continues to paint, choreograph, and act. He and his life partner and wife, Carmen de Lavallade, have one son.